Droid X Review - Learn everything you need to know about the Droid X before you buy. The Droid X is a huge improvement from its predecessor, Droid, and throws more fodder into the already raging smart phone war. With the recent release of the Android 2.2 operating system, the phone received some much needed updates. The only major complaints being the camera placement and quality, and the minute sluggishness of the OS. Droid X is still a great phone and worth the $200 you will pay with a new Verizon contract. Most people would say the Droid X is lacking in the area of elegance. It is much more rugged and industrial looking than most other smart phones but goes well with their robotic marketing theme. The back, home, menu and search buttons have been made into physical buttons-a much needed upgrade from their previous touch sensitive state. The camera placement is less than ideal. Even though there is a dedicated camera button on the spine, your fingers still seem to gravitate right in front of the lens. The Droid X screen comes in a slightly higher resolution than the HTC EVO, but not as high as the iPhone 4G. However, it has the same huge 4.3 inch display as the EVO, but no kick-stand. 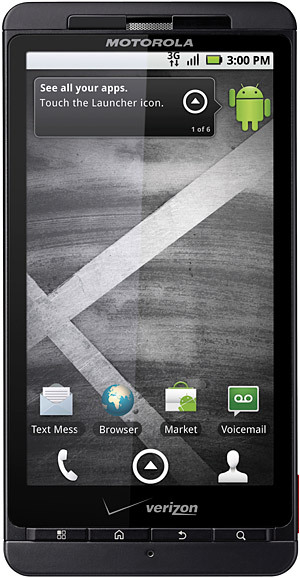 The Droid X is a great phone for multimedia and social networking. Having access to the Android community is a huge plus for all of the great social and multimedia apps. It also provides a great 8 megapixel camera, HD video recording and can become a wi-fi hotspot for other devices. The only downside for all your texters out there is the lack of a physical keyboard. This phone struggles in the battery area as well, although the official number boasts a whopping 480 minutes. The standby time is lacking as well at only 220 hours. That may sound like a lot, but in the smart phone war, it comes in almost dead last. Another great feature that takes some getting used to is Swype. This allows you to text, by keeping your finger on the screen as you move from letter to letter. A few mobile video apps come pre-installed such as Blockbuster, Skype Mobile and NFL Mobile. Since the release of 2.2, you are not limited to the YouTube app as 2.2 supports flash video (a huge upside over the iPhone4G).